Nobody thought about the fish. Stranded in parking lots, ball diamonds, soccer pitches. In basements. Backhoe buckets. A kitchen sink. A toilet bowl, severed from its gasket. An overturned bass drum. A firepit. The trunk of a Toyota Tercel. A little red wagon. A large black boot. A bassinet. A toy box. A suitcase. A child’s wading pool. A tire swing. Concerned officials and willing children picked them up and rinsed them off, launching them down their raw new limnographies. 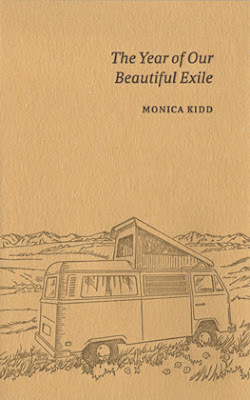 Calgary writer and family doctor Monica Kidd’s third poetry collection and sixth trade book is The Year of Our Beautiful Exile (Kentville NS: Gaspereau Press, 2015), a collection of short lyric observations composed during, as the title suggests, a year’s worth of travel with her family. The poems in The Year of Our Beautiful Exile are deceptively straightforward, suggesting a straight travel-narrative of sites visited and experiences felt and observed, instead utilizing those same ideas and stories to construct poems that, more often than not, instead focus on cadence, structure and sound. Where I think her poems are the most interesting are when she plays with form and line-lengths, including her forays into the prose-poem, which I’ve long considered some of her strongest writing. Some of the material that falls into her poems in this collection include being displaced by the 2013 Alberta flood, evolution, natural formations of earth, a variety of historical tidbits, and quotes from Walt Whitman, Jan Zwicky, Don McKay and others. Utilized as a form through which to process the world, this is a collection of poems composed as Kidd’s best thinking form, attempting to make sense of the hows and the whys and the whats included over an extended period away, aware of the arbitrariness of what exactly that means. “And what is a year?,” her opening Woody Guthrie quote asks. In the long run, perhaps little; perhaps far more than you’d think, helping reshape all that comes after. Summoning his inner bard, the mayor put out a call for nouns to describe on national television those who would walk the banks of the river in flood. (Later, a clause was enacted allowing the substitution of compelling descriptors.) Diaper licker. Hammer sack. Buzzard briner. Sharp as a heap of sawdust. Quick as a set of square tires. Cousin lover. Lost as a drunken cherry. Jug plucker. Cow tipper. This, of course, was many weeks after His Worship sat beside me at a play about Will being slaughtered by zombies. And that, gentle reader, is as true a story as they come. The poems in this collection suggest that it is a transitional work, between what Kidd has published previously, working through a series of explorations toward what she might end up producing in the future. Despite some weaker moments scattered throughout, this is a strong collection of lyric poems, all of which make me curious about what she might be working on next.